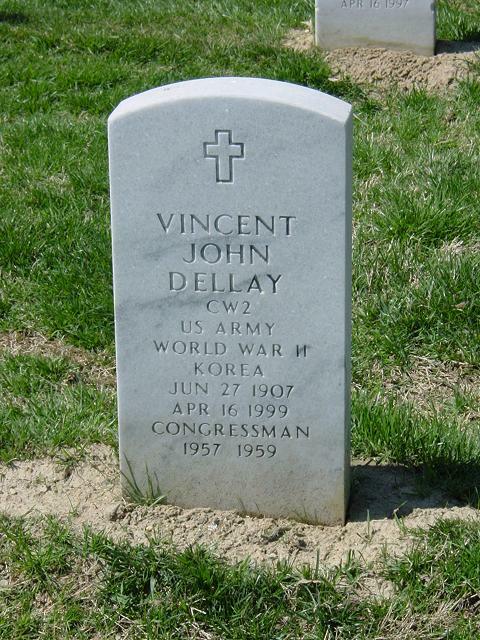 Former Representative Vincent J. Dellay, who had never held political office before he was elected to the U.S. House of Representatives for one term in 1956, died Friday. He was 91 and lived in Hasbrouck Heights. Dellay, who lived in West New York at the time of his election, represented New Jersey's 14th Congressional District, which included most of Hudson County. His constituents lived in Hoboken, Secaucus, Weehawken, Union City, West New York, and five wards of Jersey City. He was 50 when he was elected, and he took leave from his job as a supervising field auditor for the beverage tax bureau of the state Treasury Department. He returned to that position until he retired in 1972. Born in Union City, Dellay was educated at West New York High School, the New York Evening High School, and the American Institute of Banking. He served in the U.S. Navy in World War II, and subsequently became a chief warrant officer in the U.S. Army Reserve. He was a senior auditor for Sterling National Bank in New York before joining the state Treasury Department. Dellay was a parishioner of Corpus Christi Roman Catholic Church in Hasbrouck Heights, where a funeral Mass is planned for Wednesday at 10 a.m. His body will be buried at Arlington National Cemetery with full military honors. His wife, the former Ada O'Brien, preceded him in death. Survivors include a son, Vincent J. Dellay Jr. of San Diego; two daughters, Gloria A. Binetti of Clearwater Beach, Fla., and Norma Dellay Wilke of Hasbrouck Heights; 14 grandchildren, eight great-grandchildren, four great-great-grandchildren, and two great-great-great-grandchildren. DELLAY, Vincent John, a Representative from New Jersey; born in Union City, Hudson County, New Jersey, June 23, 1907; educated in West New York High School, New York Evening High School, and the American Institute of Banking; from messenger to bokkeeper, Irving Trust Co., New York City, 1923-1929; assistant comptroller, Sterling National Bank & Trust Co., New York City, 1929-1936; auditor, New Jersey State Treasury Department, 1936-1956; served in the United States Navy as a petty officer from February 1944 until December 1945; chief warrant officer New Jersey National Guard 1949-1960; unsuccessful candidate for election in 1954 to the Eighty-fourth Congress; elected as a Republican to the Eighty-fifth Congress (January 3, 1957-January 3, 1959); changed political affiliation from Republican to Democrat during the Eighty-fifth Congress; was unsuccessful for nomination as an Independent candidate to the Eighty-sixth Congress; engaged as supervising field auditor for New Jersey Treasury Department until his retirement in 1971; is a resident of West New York, N.J.